Octopath Traveler has been one of the most anticipated Switch releases since its original announcement. Still, there's likely a number of individuals out there who are confused as to what all the fuss about or aren't even fans of the JRPG genre. If you are one of those people, perhaps the trailer above might convince you the Nintendo published title is worth your time. It's a brief but comprehensive overview highlighting the eight travelers, path actions and the finer points of the battle system. 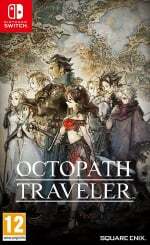 Have you got your hands on Octopath Traveler yet? Are you enjoying it or are you unsure if it's right for you? Tell us below. Downloaded this yesterday. Can't wait to play it and transfer my demo save today! That announcer makes me feel like I'm watching a trailer for an upcoming Disney movie. XD That said, it's a nice overview for the game! Everyone who wants this game probably knows everything about it already. can't be spoiled. must resist the overview trailer. It looks like a smartphone game to me. I can’t figure out what all the fuss is about. I’ll try the demo. Bought it yesterday but yet to start it, need a good 4 hr slot, maybe tonight. I’m playing the demo and this game is making me seriously consider to give rpgs a serious try! Can someone help me to understand the fun part of fighting and enemy I can not choose to engage with? I mean... you are walking around and booom, fight. Two more steps, boooom same fight. And so on. I’m trying to learn how to enjoy this gem (and all the rpgs I neglected in the past) Thanks. Where is the demo everyone keeps mentioning? When I go to the game in the app store there is no demo option. Was the demo removed once the game was released? This game might just be the best JRPG ever made. I'm 20 hours in and I"m already calling it, it's better than FF7. The real question is, is it better than FF6? I'm not sure if the story is better, FF6 had a fantastic story, the battle system is way better than 6 though. People are saying it's influenced by Bravely Default, (which I'm gonna have to buy one of these days) it reminds me of FF3 (The Japan one) through FF5 where you have job classes, only instead of letting you mix and match job classes right away they force you to get a sense for each one. I'm 20 hours in and I still don't have the option to switch job classes yet, which is fine by me though because I'm still loving it so far. That said I will say be careful who you pick as your first character because they're locked into being in your party 100% of the time. That said as I play more and more with each character I can appreciate good things about them. I feel like early on Primrose, might be one of the worst ones to have as your main character, because she's a dancer (like a Bard) so she's mostly a support character. Early on she's kind of useless for attacking (heck twenty hours in she's useless for attacking) but she can boost your attack, special attack and speed once she learns those abilities, at which point she's super useful. I've personally started off with Cyrus who's super useful when combined with Tressa. You can wipe out most random encounters with a level two spell (heck you can wipe most out with a level one spell) if it's boosted to Max, and if you use Tressa's ability to give her BP to others, you can do a max second level spell the first turn! I feel like once you can change their classes some of the characters are just going to be awesomely broken. Ophelia's ability to heal herself past max HP combined with a knight's ability to take hits for the whole party? YES PLEASE! The stories are cool (though the fact that the cut scenes don't leave your party on the screen while they happen is weirdly dumb, it's literally my only complaint about the game) and the battle system is borderline perfect. You can't just spam your most powerful spell like you could in 6 or a lot of other early RPGs. There's always a need to have variety and to use your whole party. And the break system is super cool. I literally can't say enough about this game, it's a bloody masterpiece. That said I'm not sure if there's a point where the stories all start to meld together or not. I'm hoping there is. I'm really worried that the end game might just kind of happen and not be satisfying. Though all the story progression so far has been really good so I probably should be hopeful. I confess it is weird to play a game like this where I'm not a "chosen one" and where big floating crystals haven't told me about an impending doom or anything. Also not a single character so far is a princess or a military general (there is a knight mind you) it does soooo much right without falling into some of the lame tropes that other games have. Seriously if you loved the SNES turn based RPGs just buy this game, it's amazing!